HILO, Hawaiʻi - Bonnie Irwin will take over as UH-Hilo chancellor on July 1, 2019, if the UH Board of Regents approves the recommendation at its January 31 meeting. (BIVN) – The University of Hawaiʻi – Hilo has an official recommendation for its next chancellor. Bonnie Irwin, who is currently a senior executive at California State University Monterey Bay, will take over as UH-Hilo chancellor on July 1, 2019, if the UH Board of Regents at approves the recommendation at its January 31 meeting. Irwin will replace Marcia Sakai, who has served as interim chancellor since 2017, after former chancellor Don Straney left the position to become the UH vice president for academic planning and policy. 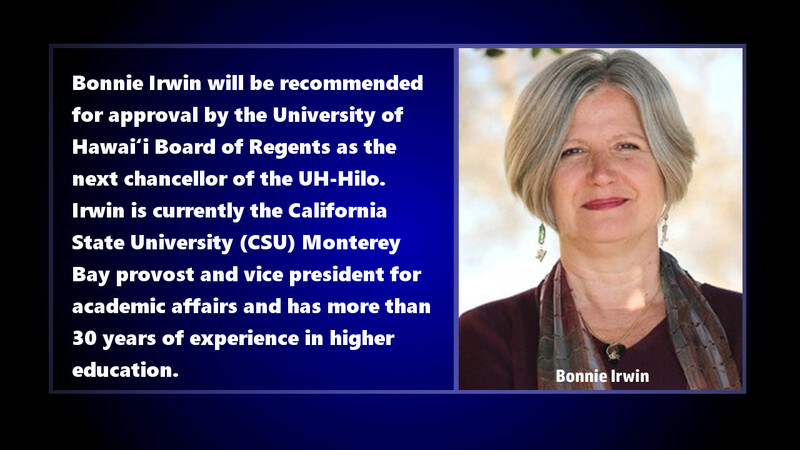 Irwin began her career in higher education in 1984 as a graduate student instructor at her alma mater, University of California at Berkeley. She also served as dean of the College of Arts and Humanities and dean of the Honors College at Eastern Illinois University prior to moving to CSU Monterey Bay in 2014. Irwin’s responsibilities as chief academic officer at CSU Monterery Bay included leading six academic colleges, a college of extended education and international programs. Under her leadership the campus expanded strategic academic offerings to serve the community while increasing student retention and improving graduation rates. As a senior executive, she collaborated with the school’s leadership team to improve university-wide effectiveness and accountability while advancing student and faculty success. She also worked on and led initiatives for the CSU system, the largest in the nation, to advance public higher education across California. After starting her teaching career at UC Berkeley, Irwin worked as an adjunct at Iowa State University before accepting a tenure-track faculty position at Eastern Illinois University. She served there as a professor of English specializing in world literature and folklore before moving into administration, where she facilitated initiatives in integrative learning, undergraduate research, guided pathways, interdisciplinary studies and inclusive excellence. She also has created faculty and administrative mentoring programs. This story will be updated with video.